Good afternoon Gregorio, we are pleased to see you! How are you doing? Congratulations for Ciclogreen’s success at the Climate Champion Awards 2015: winner of the Mitigation category in Seville, and of the Special Award, all cities comprised, which took you to the COP21 Climate Summit in Paris. We are looking forward to interviewing you. Tell us a bit about Ciclogreen, and particularly about how it contributes to mitigating climate change by reducing carbon emissions. Ciclogreen (www.ciclogreen.com) is an online platform that rewards cycling and walking (distance covered), through the use of free apps. We encourage sustainable mobility at or to the workplace providing incentives, through “Challenges” and “Rewards”, to employees who cycle or walk to work. We have succeeded at reducing emissions in the transport sector, a key factor in climate change mitigation. Users in our community have covered more than 220,000 km by bike and on foot, which is equivalent to a reduction of more than 55 tons of C02. By doing so, we are improving air quality in the city, making cities more livable and improving children health as a result. We currently have communities in different cities in Spain, including Seville, Madrid, Valencia, Barcelona and Valladolid. Progressively, we are having new cities join in, and we will soon be present in others European countries and in America, where there is a growing interest in our platform. Besides, our recent participation at the COP21 Climate Summit in Paris has created new expansion opportunities for us. What would your advice be to green SMEs starting up? I would tell them to take advantage of every opportunity to interact with others initiatives in their field by attending congresses, seminars and networking events. Cooperation and contact with other SMEs is essential to become known and make progress as a business. Looking ahead, how do you see Ciclogreen in 5 years’ time? I see Ciclogreen as a global reference incentive-based platform within the sustainable mobility field, embedded in many enterprises as part of their CSR programs. Also, we will continue to innovate, looking for global-impact technological solutions that could greatly enlarge our social and environmental impact. All in all, we want to have an active role in the change towards a more sustainable and healthy world. What did you get from participating in #ECO4CLIM15? ECO4CLIM15 allowed us to increase our network of contacts, meet new interesting professionals, initiatives and enterprises that are sharing our same goal: mitigating and adapting to Climate Change, which is at the heart of our vision and mission as an enterprise. 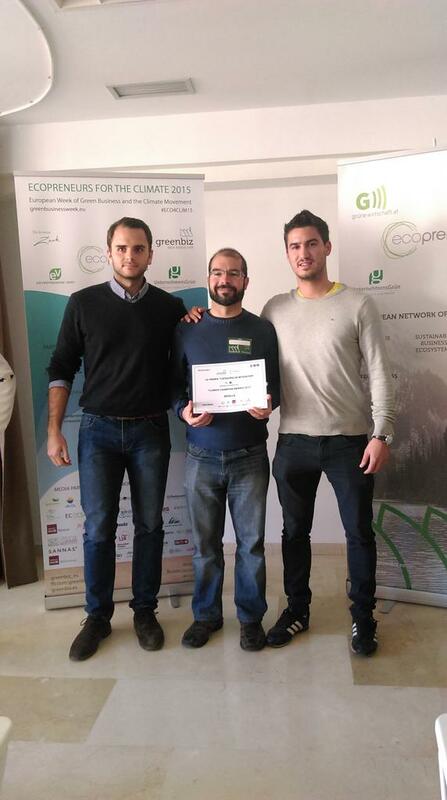 Besides, ECO4CLIM15 has strengthened and increased our expansion capacity, thanks to the awards and their reach. Would you recommend other SMEs to participate in future editions? Absolutely! It’s a great opportunity for all of them. 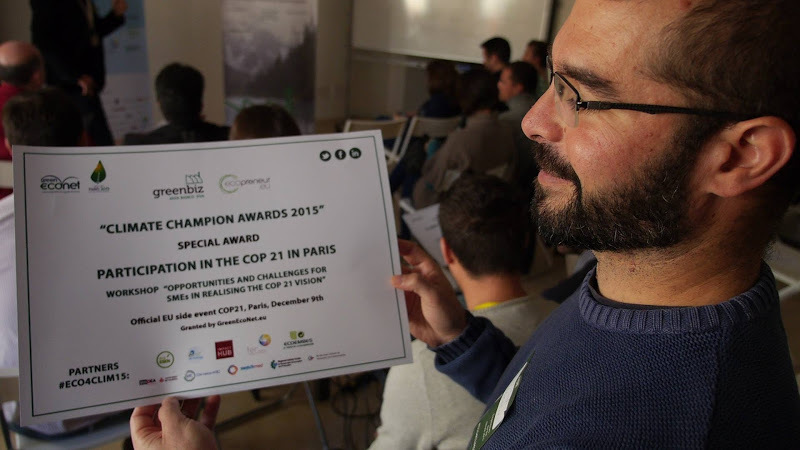 In addition to winning the Mitigation category in Seville, you were also granted with the Climate Champion Special Award 2015 (sponsored by GreenEcoNet), which gave you the chance to participate in the COP21 Climate Summit, on December 9th in Paris. What were your objectives heading to Paris? We are very excited with the recognition received as well as the opportunity of presenting Ciclogreen at the COP21 Climate Summit in Paris. Our goal at the COP21 was convey the potential global reach of Ciclogreen in terms of environmental and social benefits, which may grow even larger due to international expansion. How was the experience of taking part in COP21 official EU workshop “Opportunities and challenges for SMEs in realizing the COP21 vision” organized by GreenEcoNet? Did you make valuable contacts? Without a doubt, the experience exceeded our best expectations. The treatment received from Greenbiz, Ecopreneur and GreenEcoNet was excellent, and so was the enthusiasm and interest that our initiative sparked. The contacts made are indeed creating meaningful opportunities for us. As a result of this valuable networking, we are going to advance further and faster. Could you attend other sessions at the COP21? Yes, we attended several sessions, especially those emphasizing the role of new technologies and innovation in reducing CO2 emissions. Also, seminars on restoring ecosystems damaged by the rise of global temperatures. We found particularly interesting how the latest technological developments apply to the sustainable management of natural resources in developing countries. As winner of the Climate Champion Special Award 2015 and representative of green SMEs at the COP21, do you think the Paris Agreement supports the SMEs that work for a low carbon economy? Undoubtedly, the Agreement is a great step forward, although it would be useless without the commitment of both large and small companies, as well as the people behind them. The role of SMEs is essential in the transition, since they can adapt faster than big companies to the new challenges arising in the current context of rapid and profound change. These SMEs provide innovative solutions that can make a difference, provided they get the promotion and support they need. SMEs we are providing new tools that bring about change towards a better world. Then, it is institutions and, ultimately, people that have the power to protect, preserve and improve our environment by adopting sustainable lifestyles taking advantage of these new tools green SMEs put at their disposal. Note: transcription of the interview conducted to Gregorio M. Toral, CEO of Ciclogreen, right after his participation in “Ecopreneurs for the Climate 2015” and the COP21 Climate Summit in Paris.